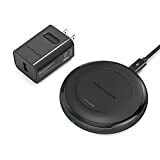 The Fast Wireless Charger by RAVPower is far and away our favorite wireless charging pad for any iPhone or Android phone that supports wireless charging. Unlike most charging pads that are made out of cheap plastic, this model is made out of sturdy aluminum that looks and feels great. It also has a no-slip rubber texture ring on top to keep your smartphone in place. Finally, it supports both 7.5W fast wireless charging for iPhones and 10W fast wireless charging for Samsung phones and other Android handsets. It launched at $50, which was a fair price for such a great charger, but right now it’s on sale on Amazon for $39.99 less 10% courtesy of an on-site coupon you can clip. Definitely grab one while you can.